Jackson and I sat on the front porch today and viewed the countryside through a different lens. While playing this afternoon, Jackson unearthed a telescope Granddad had given him for Christmas, and began looking out from my bedroom window upstairs. At first, he couldn’t see anything. It was too blurry and angled too high to catch anything but bright sky. So, I helped him set the telescope on a chest so it had firm footing and rotated the end to bring leaves of a far tree into focus. 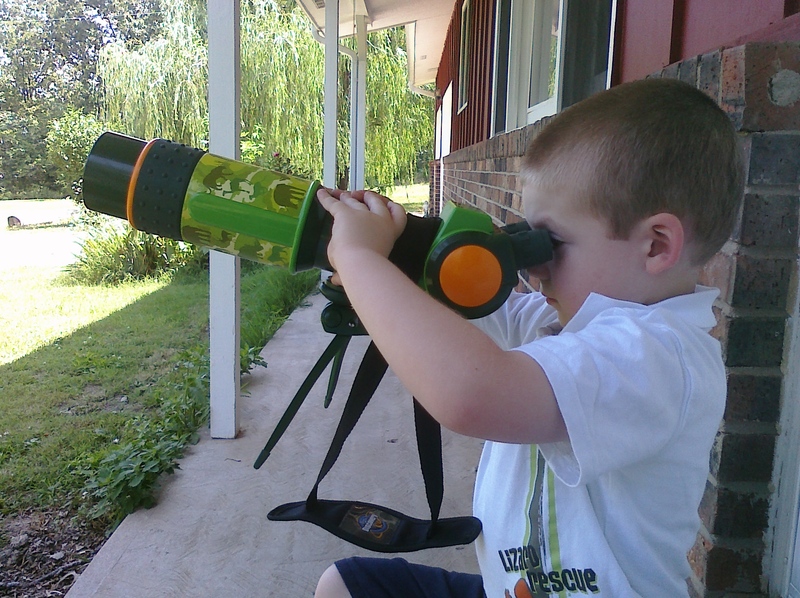 Once he got the hang of it, he was able to pick up the telescope and see other backyard fixtures with precision. He loved every moment, discovering joy in the details. So, I suggested we go outside and see the world from the front stoop. We looked with our own eyes at everything around us, and played games to name everything we could see. Looking both with the telescope and without, Jackson began to closely examine all that lived around him, from the grass and trees, to the flowers and different colored birds. After watching the work of a bee on a budding weed for quite awhile and explaining to me how the bee was taking the nectar to make food, he grabbed his telescope once again. I looked at him, and my mouth and heart smiled. Indeed.